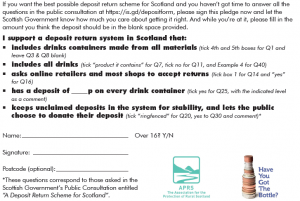 During the summer, we traveled around Scotland asking members of the public for their views on the Scottish Government’s consultation on how to design the best deposit return system. We visited the highlands, islands, cities, beaches, rural areas and even a shopping centre! Public support for a deposit return system was overwhelmingly positive everywhere we went! 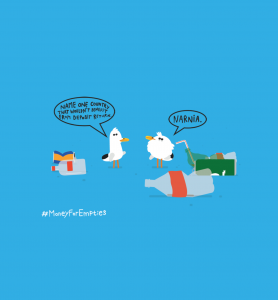 More than one thousand people signed our pledge postcard, and over sixty six percent of them would be happy to pay 20p or more – an amount that will be fully refunded when the bottle or can is returned for recycling. Members of the public also support a system that includes all drinks in all types of packaging, most shops and all online retailers accepting returns, an option to donate the deposit to charity, and for the system operator to use revenue to improve return rates.